Ayala Center Cebu putting the spotlight on Wellness with their Think Pink Campaign in observance of National Breast Cancer Awareness Month this October. 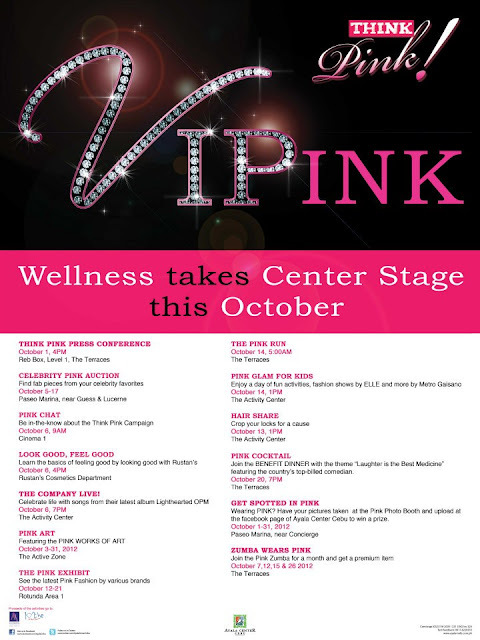 A month-long "pink" events and mall activities are readied for mall goers. Ayala Center Cebu's Think Pink activities includes breast cancer awareness and healthy lifestyle campaigns like Pink Art for a Cause, Pink Run, Pink Zumba, Pink Exhibit and more. Shoppers are encouraged to take their picture with Think Pink Icon within the Ayala Terraces and use this as their Facebook profile picture via Think Pink FB Campaign. They can also visit the Pink Photo Booth at Paseo Marina and upload at the facebook page of Ayala Center Cebu to win prizes. Another pink event to highlight for Think Pink Campaign at Ayala Center Cebu is "Pink Cocktails", a "Laughter is the best Medicine" theme benefit dinner that will feature Banana Split's Melai Cantiveros and Jason Gainza 7pm on October 20. Ayala Center Cebu Think Pink 2011 was able to raised almost P200,000 cash for the Icanserve Foundation & Kythe Foundation. Ayala Center Cebu gives Cebuanos more opportunities to show support and drive awareness. 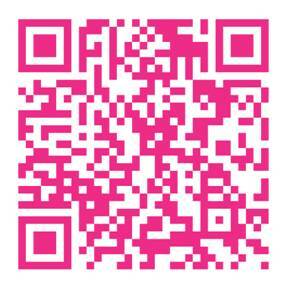 Here is a QR code to access an e-book that will guide you through Cebu from Ayala Center Cebu. Scan the QR Code to download the .epub version for iBooks for your iPhone iPhone and iPad, Android and other smartphones, tablets and e-readers and .mobi version for the Kindle. For more information, contact Ayala Center Cebu concierge at (032) 516-2035 or (032) 231-5432. You can also visit www.ayalamalls.com.ph or like their the official Ayala Center Cebu on facebook page at www.facebook.com/AyalaCebu for more details on upcoming shows and events. 0 comments: on "Ayala Center Cebu Pink Activities for Breast Cancer Awareness Month"